Most of the manufacturers tend to increase price in January, which is why sales are always good in December and the companies offer lots of discounts also. 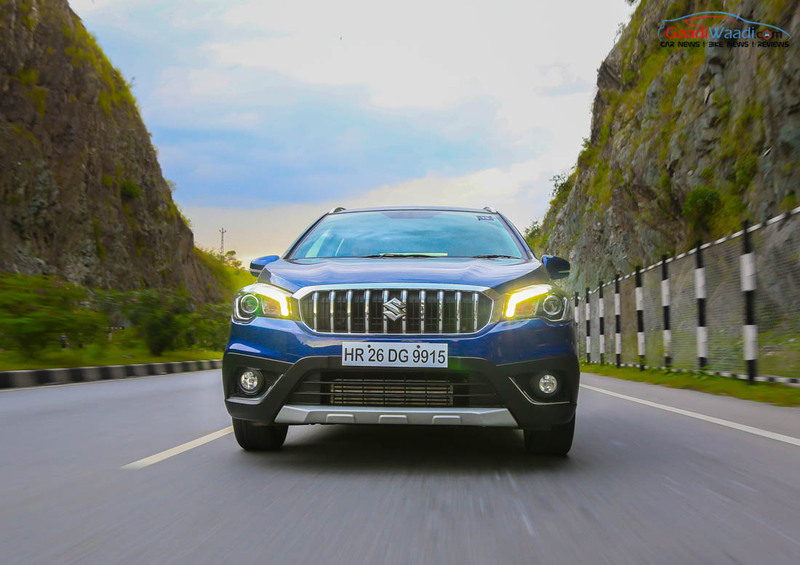 The premium wing of Maruti is offering big year-end discounts for all the models and it will be available only till the end of this month. 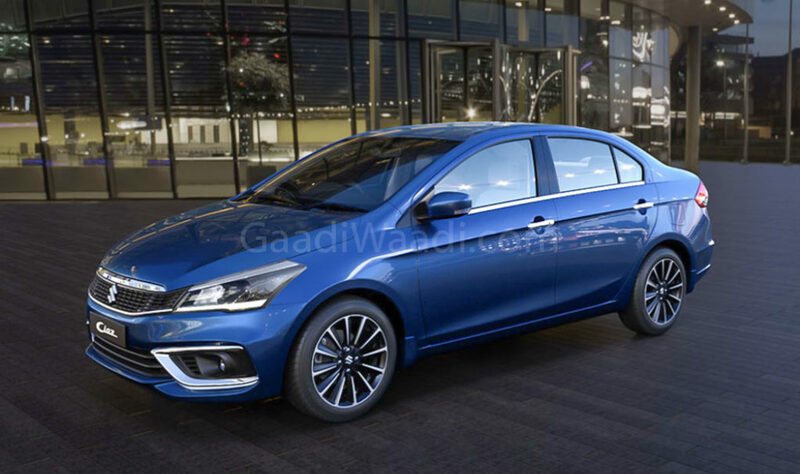 The Ciaz is the only sedan, which is sold via premium Nexa dealerships and the C-segment sedan recently received a major facelift also but the company is offering huge discounts as the entry level Sigma and Delta variant of Ciaz is offered with discounts of up to Rs. 90,000 in both petrol and diesel engine. This includes Rs. 40,000 as retail Support, exchange bonus of Rs. 40,000 and Rs. 10,000 as a corporate discount. The top-end Zeta and Alpha variants also come with Rs. 15,000 as retain support, Rs. 25,000 as exchange bonus and the corporate discount of Rs. 10,000, which takes the total benefits up to Rs. 50,000. The automatic variants of Ciaz are only offered with an exchange bonus of Rs. 25,000 only. Some dealerships also have old Ciaz in stock and the petrol model is offered with Rs. 5000 as retail support and Rs. 50,000 as an exchange bonus, which takes the total offer to Rs. 55,000. The diesel variant comes with a total discount up to Rs. 70,000 which includes 20,000 as retail support and Rs. 5000 as exchange bonus. The petrol and diesel variants of Baleno premium hatchback is offered with Rs. 15,000 as retail support, Rs. 15,000 as exchange bonus and Rs. 7000 as the corporate discount, which takes total offers up to Rs. 37,000. The Ignis is one of the least selling cars from Nexa dealerships and it also comes with heavy discounts. The petrol manual model comes with Rs. 72,000 discount, which includes Rs. 15,000 as consumer offers, Rs. 25,000 as retail support, Rs. 25,000 as exchange bonus, Rs. 7000 as the corporate discount. The petrol automatic gets Rs. 15,000 as consumer offers, Rs. 30,000 as retail support, Rs. 25,000 as exchange bonus and Rs. 7000 as a corporate discount, the total benefits is Rs. 77,000. 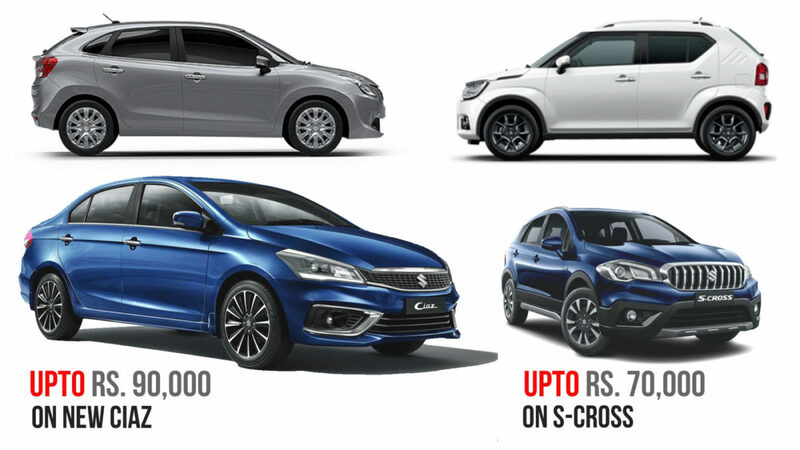 The S-Cross received an update last year, which helped the company to improve sales and most of the people prefer top end models which is why entry-level Sigma and Delta variants come with a discount of up to Rs. 70,000 which includes Rs. 35,000 as retail support, Rs. 25,000 as exchange bonus, Rs. 10,000 as a corporate discount. The top end Zeta and Alpha variants with all the bells and whistles come with Rs. 10,000 as retail support, Rs, 25,000 as exchange bonus and Rs. 10,000 as a corporate discount, the total discount is Rs. 45,000. The company is expecting the sales to increase with these huge discount offers and end 2018 on a high.